I love this damn record. If you go for grown-up and well arranged pop records, you might too. 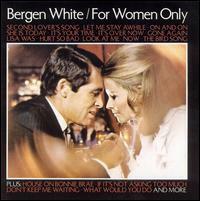 Bergen White was a Nashville arranger who got himself a solo deal in about '69 or so. But this ain't no country joint. It's more soft psych pop. Think Bread, but with a little more punch. That doesn't sound good to you? How about this - it has what was probably the first ever Townes Van Zandt cover. That's class. a good poppish record. good arrangemets.